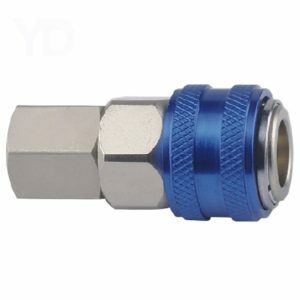 Connecting air hose fittings is an straight forward task and they are designed to be easy to install. Step 1: Choosing the correct air hose fitting type and size that you need for your connection. 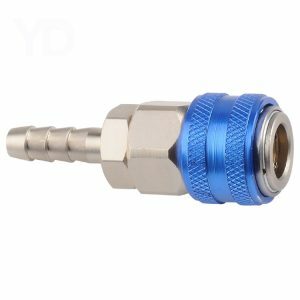 Male Air Hose Fittings: Have an male thread connected to the quick release air fitting and are easily screwed into any female thread. 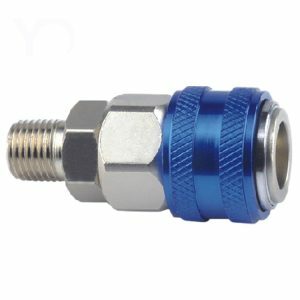 Female Air Hose Fittings: Have an female thread connected to the quick release air fitting and are easily screwed into any male thread. Barbed Air Hose Fittings: Have an barbed connector connected to the quick release air fitting and are easy to attached to any rubber air hose making them the ideal solution for rubber air hose fittings. These can be seen here on our website if you would like to place an order to receive an quote. When using an barbed hose fitting you will also need a pipe clamp to connect it to your rubber air hose. Step 2: Connect the fitting to your current system. When you use threaded fittings all you need to do it screw the fittings onto each other and tighten them up. Ensuring you use thread tape or sealant to make sure you do not have any air leaks. If you are using a barbed fitting to connect then you will need to push these into your air hose and tighten up clamp as shown in the video above. Step 3: Connect your air tools or hose and turn on your compressor to ensure that you have no air leaks.